A blog about our thoughts, services, upcoming features and the industry at large. Sometimes, you get an inquiry from the same person twice because they're considering different booking scenarios. You've already responded to them offline but don't want the second inquiry showing as "Unanswered" on the grid and you don't want to delete it. Now you can set the answered status manually. International travelers, particularly from Asia, tend to use JCB and Diners Club more often than American and European travelers. Some owners have merchant accounts that already accept Diners Club and JCB but, previously, the system didn't include that option. Now it does. 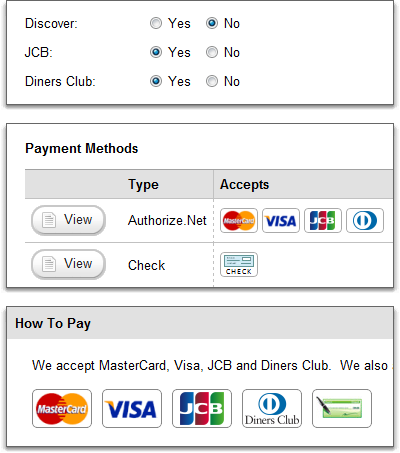 If you have a credit card payment method, you can configure it in the system to accept Diners Club and JCB. Remember, your merchant account provider has to actually support Diners Club and JCB in order to turn those settings on in OwnerRez. If you're not sure, call your provider. The guest's first payment has always been based on a percentage (1-100%) of the total charges. Now, you can require a fixed amount instead. If the fixed amount is greater than the total charges, the guest is required to pay the entire booking up front. It's nice to be able to see how many people are coming and how long the guest is staying without having to click through to the booking, quote or inquiry record. Previously, you could see how long the guest was staying by looking at the date columns, but we've added a 'Nights' column to make it easier. To be clear, these columns were added to all three grids - bookings, quotes and inquiries. You can sort these columns, like all the others, by clicking on the header. Not all inquiries are sent in with a first and last name. Some listing sites don't separate the name into two fields, and inquiries end up coming in with only the first name. This used to create a conflict with quotes because quotes required both first and last names. Not any longer. Now you can create quotes, either manually or from an inquiry, with only a first or last name. One of them is required, but not both. Previously, if a quote was prepared for a person not in charge of the group - a spouse, for instance - the booking would end up with the same name. 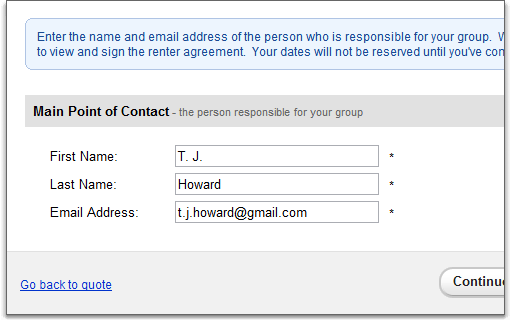 There was no place for the guest to change the name and email address to the person responsible for the group. A new page has been added to the quote acceptance process, one step prior to the renter agreement, asking the guest to confirm the name of the person in charge. In the future, we'll be expanding this page to ask for phone numbers and the guest list (should you want your guests to provide that information). In more than a dozen places, mostly on email templates, we changed the wording to clarify language that may not apply to certain guests or bookings. For instance, not all guests pay with credit cards so clauses that are specific to credit card payments are now prefaced with "If payment is made by credit card...". If you know in advance that you're not going to release the security deposit on a specific booking for a period of time that is out of the ordinary, you can now customize that at the quote level. Previously, the release days setting only existed at the property level. As most users already know, the 'release days' only refers to the days the system waits before sending you an email reminder. The system never automatically releases the security deposit with your direct confirmation. Can you add CELLPHONE Number, to be filled out? Also, the Main Person Responsible For Your Group concerns me. ME PERSONALLY, I would like wording to include that THAT said person is staying at the house. In other words, not a Parent being responsible (via damages) but not being at the house with 18 year olds celebrating their PROM night. You know what I mean? I have had several phone calls about the above senerio and I don't want any part of it! The person RESPONISBLE is a person that is 25 years old and above and is STAYING at the house, during the enter checkin throught checkout dates. I don't know if there can be an option to select this under properties, if others don't mind it. Where is everyone in their comments? I seem to be the only one, since I joined. Would love to hear from others and what they feel about all these comments being made. Do they agree with me? Don't agree? Getting phone numbers is on the dev roadmap as is requiring them to provide the guest list (name, age of each guest). That will be a part of that contact page in the near future. I know what you mean about the responsible person - making that clear. Keep in mind that you can always adjust your renter agreement to make that clear, which they then have to sign on the following page. So they'll be agreeing to it one or another. I'm not sure how it would best to make the contact name page clearer, but we'll think about the implications of that. I used to email Michele, in the beginning and then she brought the forum up. I then decided that it was best to put it on the forum, so that everyone (owners, etc.) can see what is being discussed and they can also chime in and say what they would like to see, giving you a better idea of what owners are looking for. Others are satified and others seem to be asking for a lot (Me). Hope you don't mind the comments. I know what I have problems with currently, sending everything manually, and what I would like to see to make my job (and other owners) easier. I know this is an old post but I was rereading it through and thought of a possibility for claudia and my concern of the responsible person being on site throughout the rental period. What if you added a check mark saying something like - person above will be at the rental during the whole rental period. Yes, No - if yes, ok - of no - somehow flag it to the owner to research it further but don't prevent the booking, since I am not sure if other owners would like this feature. If left blank - either don't move on and give an error or just flag it for the owner to follow up on it. Thanks for the suggestion, Silvia. I can certainly understand why you might want that. I'll suggest that something like that is added when that page is filled out. We are an online booking service for vacation rental property that helps managers and owners save time, create quotes and bookings faster, look professional and keep detailed records without needing an accountant or staff. Portal access for owners and staff released!